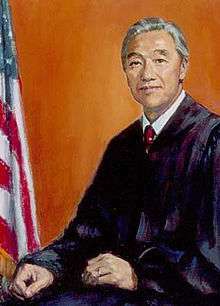 Herbert Young Cho Choy (January 6, 1916 – March 10, 2004) was the first Asian American to serve as a United States federal judge and the first person of Korean ancestry to be admitted to the bar in the United States. Choy was born in 1916 in Makaweli, Hawaii, to Korean immigrants who worked in sugar plantations in Hawaii. Choy received his Bachelor of Arts degree from the University of Hawaii in 1938 and his J.D. from Harvard Law School in 1941. He was the first person of Korean ancestry to be admitted to practice law in the United States. He was a Hawaii Territorial Guard from 1941 to 1942, and he was in the United States Army from 1942 to 1946. From 1946 to 1947, Choy served in the United States Army Judge Advocate General's Corps. After leaving the service, he worked with the firm of Fong Miho Choy & Robinson from 1947 to 1957, where one of his partners was the future U.S. Senator Hiram Fong. From 1957 to 1958, Choy served as Attorney General for the Territory of Hawaii. On April 7, 1971, at the urging of Senator Fong, President Richard Nixon appointed Choy to the United States Court of Appeals for the Ninth Circuit, to a seat vacated by Stanley Nelson Barnes. At the time of Choy's appointment, there were no Asian Americans serving anywhere on the federal bench. Choy was the first individual from Hawaiʻi ever appointed to the court. Choy was confirmed by the United States Senate on April 21, 1971, and received commission on April 23, 1971. Choy actively served until October 3, 1984, when he took senior status. He was a native of the Hawaiian island of Kauai and had chambers in Honolulu. In 2001, one of Choy's former law clerks, Richard Clifton, became the second judge from Hawaii to serve on the Ninth Circuit. Choy authored many significant opinions, upholding the constitutionality of a law allowing child sexual abuse victims to testify via closed-circuit television, allowing a Muslim inmate to sue Phoenix-area jail officials for imposing discriminatory security measures at Muslim services, and upholding California's "green advertising" law regulating advertisers' claims about "biodegradable" or "recycled" products. He died in Honolulu, Hawaii on March 10, 2004 due to complications from pneumonia. ↑ "Isle Judge was Asian Pioneer in the Law Field Nationwide". archives.starbulletin.com. March 12, 2004. Retrieved July 20, 2015. ↑ "Herbert Choy served on 9th Circuit Court". the.honoluluadvertiser.com. March 12, 2004. Retrieved July 20, 2015. Herbert Choy at the Biographical Directory of Federal Judges, a public domain publication of the Federal Judicial Center.